Convert DVD Movies To Ur PSP!!! Thread: Convert DVD Movies To Ur PSP!!! - a Sony PSP . Yet another DVD-to-PSP tutorial? Why? Because there’s a lot of confusion about this topic and everyday we read stories that spam crappy commercial software that does the job but mostly they don’t do it so well. So I decided to share my method, that is simple (also n00bs can take advantage of it) and it needs just (good) freeware software to be accomplished. 1) Put the DVD movie you want to rip inside your optical drive. 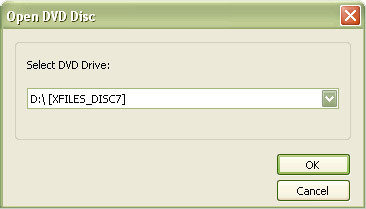 2) Run DVD Shrink, click on “Open Disc” and select the rigth optical drive (if you have many of those), then click on “Ok”. 3) Click on “Re-Author”, then click on “DVD Browser” and drag&drop the movie title you are interested in from right frame to left frame. Don’t add more than one “title” or the final .MP4 file will contain them both. If you want to rip a movie, choose the longest “Title” available (the other titles probably are the extras). 4) Click on “Compression Settings” and delete all the languages and the subtitles you don’t care about. If you want to rip the same movie with n different languages, you will have to follow this procedure for n times. 5) Open “DVD Shrink Preferences” and uncheck the “Split VOB files into 1GB size chunks” option, then click on “Ok”. 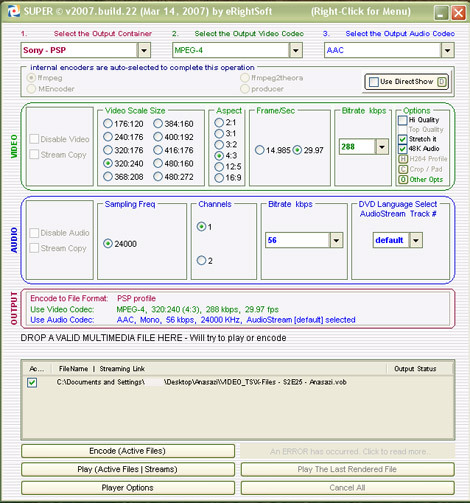 This step has to be accomplished just one time and it’s needed because it says to DVD Shrink to create one .vob file for every movie (Super Converter can’t join yet multiple vobs into a single mp4 file). 6) Click on “Backup!” and in the new window that’s appeared, choose “Hard Disk Folder” under “Select Backup target”: this option saves the movie into a folder, that you decide clickin’ on “Browse”. When everything is fine, click on “Ok”. 10) Run “Super Converter”, select the right preset for our device (”Sony - PSP”) and eventually modify some parametres for our needs (example: reduce bitrates to reduce filesize, sacrificing the quality); then drag&drop our .vob file into the area under “DROP A VALID MULTIMEDIA FILE HERE” and click on “Encode (Active files)” to start converting. At the end of the process (that needs from some minutes to some hours depending by how many files you added to the list, by how long they are and by how fast is our computer) you will get your nice .mp4 file, ready to be copied on your PSP. Cool, isn’t? ;) Enjoy! Very nicely presented tutorial, but we already have a load of them in the tutorials section. Sorry to be the one to tell you that you wasted your time. i'd never heard of Super converter...so thanks for that link. Does this do full-screen for 16:9 movies? Thanks for the link to the converter. I heard the PSP now supports 720x480?